Want to hear more clearly in noisy environments, in the classroom or at work? The Roger™ Clip-On Mic can be used with the brand new Roger 21 from Phonak to help you hear every word of the conversation with your SONNET. Megan, an adult cochlear implant recipient, tested out this product over a few weeks and shares her review with us! The Roger 21 is just as easy to attach and detach to / from the control unit as the standard battery cover. It had a snug fit the first couple of times attaching / detaching but loosened up a little over time and now slides right on. When wearing the Roger 21, I don’t really notice a difference in comfort—it’s a little longer than the standard but doesn’t feel awkward or uncomfortable. If needed, I think I could wear the Roger 21 all day and it would be just as comfortable as wearing the standard battery cover. 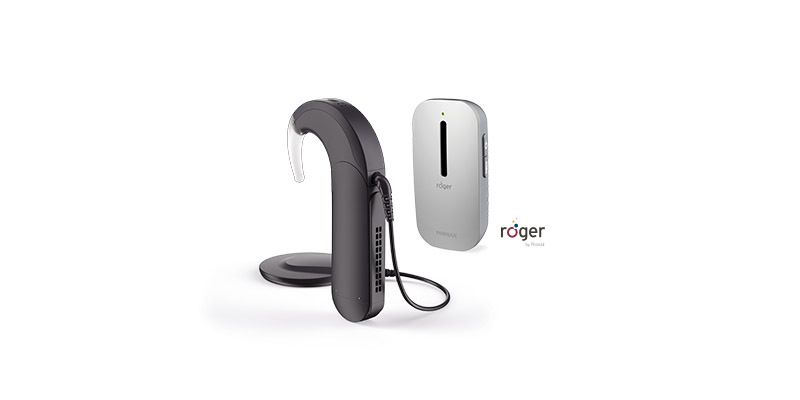 Currently, I am wearing the Roger 21 and Clip-On Mic to give me a boost in certain situations such as noisy places, group conversations or activities, and on the phone. It’s super easy to connect the Roger 21 with the Clip-On Mic. All you have to do is turn on the Mic, replace your audio processor battery pack cover with the Roger 21, and press the connect button on the mic until the light turns green, which symbolizes successful pairing. You can then clip it to your friend, family, or co-worker’s shirt. If they do not want to clip it to their shirt they can use a cord around their neck that the Mic clips on to. There were no issues with the mic falling off or moving while clipped onto people. I think the look, size, and portability of the Roger 21 is great! It’s one piece, discreet, and sleek in design. All throughout high school and college I used a Phonak microphone and two external receivers that were attached to my hearing aids—they were both very cumbersome and obvious. The Roger 21 is much more compact and so discreet. The look, size, and portability of the Roger Clip-On Mic is really nice. I like that there are no wires and the microphone is built into the unit. It’s small and super easy to carry around, taking up virtually no space. However, I’m sure it would be easy to lose as it is small, so pay attention! Here are my ratings of the audio quality of the Roger 21 with the Roger Clip-on Mic, 1 star being “very bad” to 10 stars being “outstanding”. 8 stars: If the person is moving or bending over, it can sometimes make a slight banging sound when clipped onto loose clothing. 10 stars: The sound quality is very good when connected to the TV via the docking station. What’s also great is that it is possible to set up the docking station so that there is still sound going through the TV for other people to hear too. 10 stars: I thought the sound quality was really good with the USB audio cable. It sounded nice and full, not hollow. I even heard new parts to songs I didn’t hear before with other assistive listening devices or with just my audio processor and hearing aid. Using the docking station to connect to the TV via direct audio input is easy if the TV has a headphone option. For me, there was no headphone plug option in my television, so I instead used another audio output cable from my television to plug into the docking station. There were no issues connecting to my phone via the USB cable. It was very easy! I used the rechargeable standard battery when using the Roger 21 receiver. It lasted a little over 7 hours, so 4 hours less than using them normally just with my audio processor. I thought that was pretty good considering how much power it takes. The battery for the Clip-On Mic lasted 8 hours before needing to be charged. Charging the Roger Clip-On Mic was easy. All I had to do was place it into the docking station, attach the charging cord to the back of the docking station, and plug into the wall. I think the Roger Clip-On Mic would be good for any cochlear implant user. We can all benefit from it in some way as it has multiple applications: TV, music, phone, group conversations or activities, noisy restaurants, lectures, classroom, car rides, etc. If I were still in school, I would have loved having this for the classroom, as it’s so sleek and compact with no wires or anything that needs plugging in. The best thing about the Roger Clip-On Mic is that it performs great in noisy situations like restaurants. I was pleasantly surprised to find this out because there are no additional settings where you can eliminate the background noise and focus solely on the person talking. I thought the opposite would have been true in noise. One thing I did notice about the Roger 21 and Clip-On Mic is that there is no way to loop in my hearing aid on the right side unless I have a second external receiver. Other ALDs use Telecoil, which allows me to loop in my hearing aid. It’s not a big deal, just something I noticed. My left ear is stronger anyway! Another awesome thing the Roger Clip-On Mic has is good sound quality and connectivity up to 15 feet before it starts to get static. So you have the freedom to move a fair distance away before the person, music, or TV starts breaking up. I would say the main benefit of this product is the ability to make voices sound closer and clearer especially in noisy settings, group settings conversations or activities, or in the classroom. Overall, I am so impressed with the design and function of the Roger 21 and Clip-On Mic. The ones I had through the years for school were so big and had a lot of excess parts like cords. This is truly amazing progress!